When I first came to study in the Netherlands, my life there started from a new page. I didn’t speak the language, I didn’t know how to use public transport, I knew nothing about the city and I had no friends. Looking back, I realize I had felt like a child. Weeks before my exchange ended, some of my friends have already departed. I felt like an old man getting his things in order. But let’s start from the beginning. 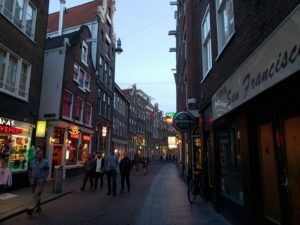 I chose the Netherlands for many reasons, including a huge number of people that I know who fell in love with the country; some of my friends are currently studying there, and they never looked back. Then, Erasmus University is among the best universities even by Dutch and worldwide standards. The Netherlands are as developed as a country can be, and that was one more thing that I was attracted to. I thought that going to study abroad was challenging enough, and I didn’t want to make things more complicated by having to adapt to a significantly different culture and/or unfamiliar living conditions. The mandeville building of the EUR campus has greetings in various language written on one of its walls. Notice the Estonian “Tere tulemast” in the upper left corner. This immediately made me feel at home. I had some earlier experiences abroad, from a few youth projects Europe to the 4-week Benjamin Franklin Fellowship at Wake Forest University in the US four years ago– which I loved dearly. Still, at all these events there were some “training wheels” attached, and I felt guided by the organizing people at all times, who made sure I ate, did stuff and had a good time. 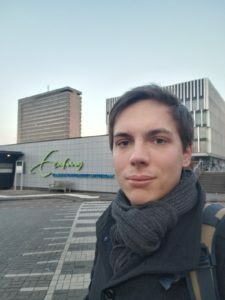 When I landed at Schiphol airport, however, Erasmus welcoming party gave me a ride to Rotterdam Central station, showed me how to buy a train ticket… and that was it! Me, standing in the middle of a street, with no one telling me what to do. Complete freedom! I can’t stress enough how profound this feeling was for the first time. Perhaps comparable to the first time I alone got to drive a car. Such tremendous responsibility with no one looking over my shoulder! 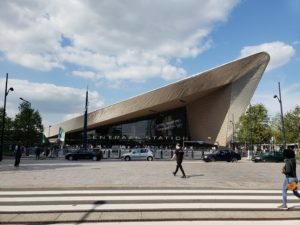 Rotterdam’s iconic Central Station was the first thing I have seen in the Netherlands outside Schiphol Airport. It was the first amazing sight in a kaleidoscope of new discoveries. At first, I was a bit overwhelmed by being on my own in a foreign country. There were many things I needed to learn and memorize. That was my childhood phase. First 2 or 3 weeks not a day went by without me saying “I am Vlad, what’s your name?” I was also constantly getting lost. You might laugh, but I actually found the optimal cycling path from my home to the university in around November – well halfway through my exchange. I was a late bloomer. Every day I met someone new. Most of the time, entirely by chance and never to be seen again. Some, however, stuck around. It’s easier to meet people when you are in an unfamiliar place, because you are not expected to know anyone, but approaching people still requires courage and effort to make a good first impression. I am happy to say that I had that courage, and some people that I met turned out to be very special, tremendous people, who largely defined my experience at Erasmus University. 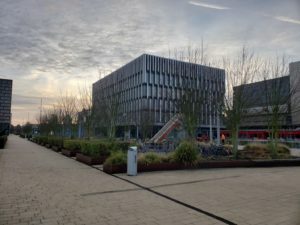 Erasmus Campus at dawn. Every bike has an owner. Every bike owner makes this place unique. As far as I can tell, the experience abroad really boils down and is defined by the people you are surrounded with. Sure, Erasmus University has a very nice campus. In fact, it’s like one of these campuses from the movies, which I had never had a chance to attend to myself. I have stayed at a very posh Wake Forest campus, but not for 5 months like I did at Erasmus. So, in a way, I got this luxurious “study at campus” experience in Rotterdam, but what is the point if there is nobody to share that joy with? As I “matured”, so did my relationships with people around me. Lecturers started recognizing me. When I introduced myself to people I had never seen before later into exchange, they would sometimes say “ah, you are that guy from Estonia?” It helps that there are, in fact, very few people from Estonia on campus, but that reaction shows I did become a part of the Erasmus community, and that is a much more rewarding feeling, than just being physically present there, or anywhere else, for that matter. People have heard about me before we ever met, because during classes I was asking questions, sometimes provocative, and I was always among the first in the class to respond if the lecturer had a question for the audience. I was there, and my presence, however little important, shaped the classes that I took. We would not have had the same discussions and the same atmosphere in class, had I not been there. The same, certainly, goes for every other person. That is, in my opinion, precisely why people matter infinitely more than the physical place. After all, without people, a university is not different from any other building or place on Earth. There should still be Erasmus University 100 years from now, and maybe it will preserve a lot of its current architecture. What can be never preserved, however, is the zeitgeist – the spirit of the time – which is made up of every present individual’s thoughts, behavior and the unique perspective that they bring to the table. So, to the discussions at certain IBCOM classes at Erasmus University in 2018 (and the beginning of 2019), I brought mine. From September of 2018 to January of 2019, I helped shape Erasmus University. For the rest of my life, Erasmus will have shapen me. And you never know who you will meet on your exchange. I am convinced that among the amazing people I met there are at least a few future decision makers, entrepreneurs and perhaps world leaders. You can meet your future boss, a celebrity, a true friend or even a life partner. I myself am not entirely sure, to which extent all of my new relationships at Erasmus will impact my life, but I know it will not be the same. Digital technology and air travel make sustaining and growing these connections easier than ever, too. There has never been a better time to go study and meet new people abroad. This is why, although I am incredibly sad to leave, I am ready to move on. Some of my friends have left the Netherlands weeks before I did. Those who haven’t, will do so eventually. 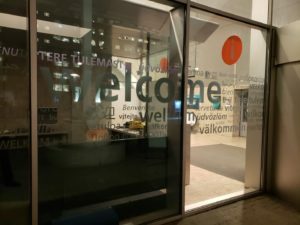 In a few years, the student body of Erasmus University will consist of entirely new, unfamiliar people. 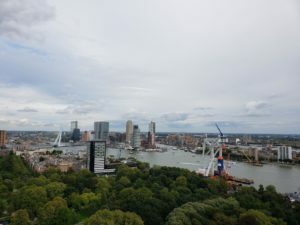 AT the time when I was writing this, I still had some time left in Rotterdam, and I am proud to say I enjoyed it the best I can, and I have no regrets. Exchange does feel like a life within life, but the good thing is, that is not entirely true. While “exchange life” is relatively short, our general life goes on after that. The fleeting nature of my time at Erasmus has taught me to pay attention, seize the moment and go after opportunities as they unfolded before me, because I wanted to make the best out of the 5 months I had in the Netherlands. Now, I realize, that there is no reason to stop doing that once these 5 months. What’s behind the corner? Only one way to find out! It makes sense to always pay attention, seize the moment and pursue the unexpected chances life presents you with, wherever you are, whatever it is you are doing. That I consider to be the most important thing I learned as an exchange student.